As usual, I am hungry, but not grossly hungry, so eating at the Van Dam Diner does often satisfy some cravings. 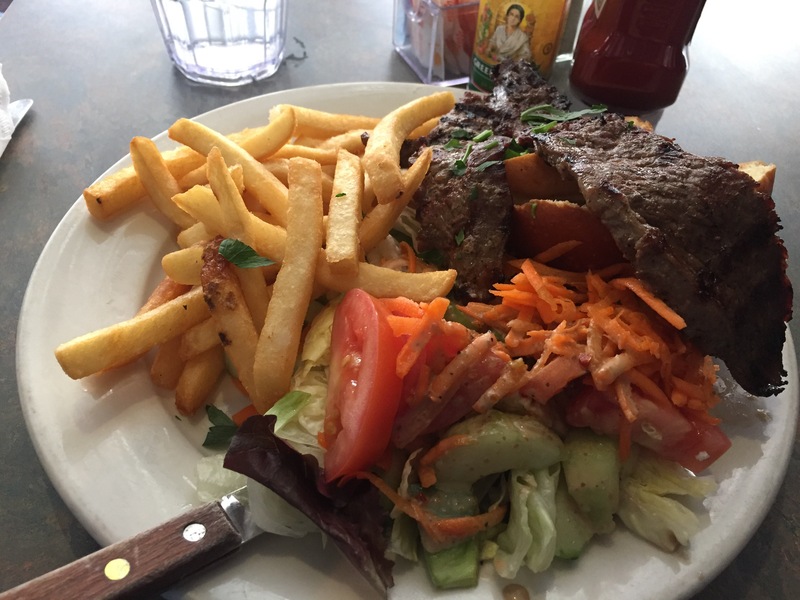 However, since the portions are huge, I usually don’t finish all of the tasty items on my plate, then I have to deal with the overly-concerned serving staff…one time I was in a surly mood right after the election, and I picked at my food, which the servers took offense. Anyway, usually a sandwich special is enough food, so I ordered a opened-faced beef sandwich deluxe on a brioche bun, including a green salad (shaved carrots, romaine lettuce/white cabbage mix, green peppers, tomatoes, cucumbers and vinegarette dressing) and French fries. I was expecting roast beef. It was three pieces of strip streak I trimmed down to fit inside the bun. Even a ton of A-1 steak sauce couldn’t save it. I had three bites, and I was then done. Strip steak should not be on a sandwich.